When we last gathered in these hallowed halls, Apple had released Mavericks and I gave you a tour of its most visible new features. Prior to that, we were just getting into the mechanics of iMovie '11. But wouldn't you know it, Apple released a new version of that program as well. And that leaves us where? As the keeper of these classes, I've formed a plan. A plan that goes a little like this: Nearly everything I've taught you about the Mac in these Mac 101 lessons is just as applicable today as it was when I wrote the original lessons. Mavericks has a handful of new features, but it's not a radical departure from Mountain Lion. So there's no reason to start again. Similarly, the new iPhoto is nearly a carbon copy of the previous version, so we can leave it alone too. The new iMovie 10, however, is different enough from its predecessor that it makes sense to reboot that series, this time focusing on what it has to offer. So open your notebooks, update your copy of iMovie (it's free if you already have a copy on your Mac), and let's begin. In our first iMovie '09 lesson, I took you on a tour of the interface and pointed out the five panes and the central toolbar that iMovie used to do its business. With iMovie 10, Apple rejiggered the interface--so back we go to see where each element now lives. The left side of the iMovie window contains the Libraries pane. The top portion of this pane is filled with links to your photos, projects, and movie events. At the very least you should see entries for iPhoto Library', All Events', All Projects', and iMovie Library'. When you select iPhoto Library, any events within iPhoto appear in the Browser pane that appears just to the top-right of the Libraries pane. (We'll explore the Browser more thoroughly shortly.) Choose All Events, and any movie events you've created populate the Browser. Select All Projects, and projects you've created in iMovie appear as thumbnails in the Browser. Clicking iMovie Library also shows your iMovie events--this time laid out on a timeline, rather than as a thumbnail. Click the downward-pointing triangle next to the iMovie Library entry, and you see a list of individual events. At the bottom of the Libraries pane is the Content Library. This takes the place of the many buttons that used to occupy the right side of the iMovie '09's toolbar and includes entries for Transitions', Titles', Maps & Backgrounds', iTunes', Sound Effects', and GarageBand'. When you select one of these entries, items related to it appear in the Browser pane. As I mentioned, when you select a library item, you see some kind of preview of that item in the Browser pane. If you choose iPhoto Library, you find, by default, thumbnails of your iPhoto events. But click the Events entry that appears at the top-left of the browser, and you discover Faces', Places', Albums', Facebook', Flickr', Smart Albums', and Slideshows' entries. Click the one that will lead you most quickly to the image you want to view. When you do, the item's main thumbnail image appears in the Viewer pane, which is just to the right of the browser. To see the contents of a selected item (an event or place, for example), double-click on it. All images within the item will appear in the browser. To navigate back, click the heading--Events, for example--that appears at the top-left of the Browser pane. The Browser pane also has a Search field. If you've gone to the trouble to tag your images, you can use this field to find them more easily. However, search is contextual. For instance, if you're viewing by Event, typing in a location won't cause images geotagged with that location to appear. Instead, you must choose Places from this menu and then search for the location. Likewise, if you want to search for a person by name, choose Faces--unless you've specifically tagged an image with that person's name as a keyword. The large Project pane at the bottom of the iMovie window is for assembling your movie. By default the Project pane displays clips in a fairly traditional timeline view, rather than wrapping clips through the pane as if they were part of a long ribbon. If you like the ribbon approach, choose View > Wrapping Timeline. To add an item to the timeline, simply select it (or select a portion of it, in the case of a video clip) and either drag it into place or click the plus (+) button that appears in the bottom-right corner of the selected item. As with the previous version of iMovie, you can shift items in the timeline by selecting and dragging them to a new position. If clips disappear off the edge of the pane when you look at clips in the traditional timeline view, use the Zoom control in the top-right corner of the pane. Drag it to the left, and preview increments increase--from, say, one thumbnail for every 5 seconds of video to one for every 10 seconds. Next to the Zoom control is a pop-up menu for adjusting the clip's height, width, or both. You also have the option of showing or hiding audio waveforms at the bottom of the timeline's clips. I find it helpful to leave them on, as they provide visual clues about where sound stops and starts; but you can turn the waveforms off if you don't find them helpful. At the bottom of the Project pane is a music track area. If you'd like some background sound to accompany your video, just drag a sound file into this area. The Viewer pane appears at the top-right of the iMovie window. When you select a media item in the Browser pane, information about that item will appear in the Viewer. 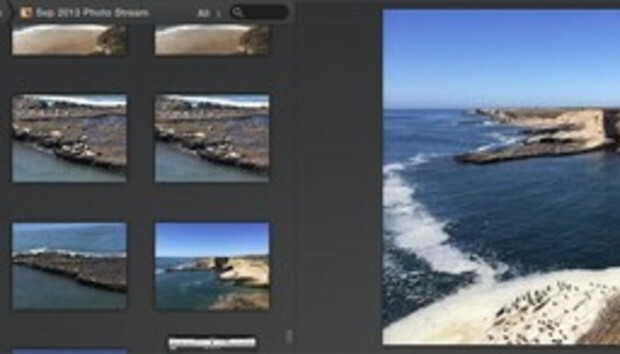 For example, select iPhoto Library in the Library pane followed by an event in the Browser, and in the Viewer you see that event's main thumbnail image, its date, and the number of photos and video clips it contains. Select a project, and you see the clip's resolution and length. And if you choose an event, you can scrub through the contents of that event in the Browser and see the results in the Viewer. Likewise, when you scrub through clips in the Project pane's timeline, the Viewer displays that content. Select a point in the timeline and hover your cursor over the Viewer, and play controls appear that allow you to navigate through the project using Back and Forward buttons, play or pause the project, and view it in full screen. iMovie 10 does its best to keep you from turning to menus for common commands by placing those commands in the toolbar at the top of the window. Here you find the following options. Import: Click this button, and an import window appears. You can use it to navigate to media files that you'd like to import into your project. By default, the imported item is added to the event currently selected in the Libraries pane; but from the pop-up menu that appears at the top of the Import window, you can select a different event or add it to a new event. You're free to select more than one item. (Any that are incompatible with iMovie are grayed out.) Alternatively, you can drag compatible media files directly into the timeline. Create: Click Create, and you can create a new movie or a new trailer--a special kind of templated iMovie project that I'll discuss in another lesson. Share: iMovie 10 gives you plenty of ways to share your work with others (though there's no direct export to Apple's discontinued iDVD application). Click Create and you find these options: Theater', Email', iTunes', YouTube', FaceBook', Vimeo', CNN iReport', and File'. We'll talk about sharing in the future. Library and Theater: iMovie's default view is Library. Here you view your media assets and work on your projects. Theater is iMovie's version of Photo Stream. In this case we're talking about video rather than photos, of course, but it's the same idea. When you add your finished movies to iMovie Theater, the movies are shared with any compatible Mac or iOS device that has the latest version of iMovie installed and is linked to your Apple ID. (Apple TV also bears an iTunes Theater channel.) iMovie Theater is also a subject for a later time. Enhance: When talking about iPhoto editing, I explained that application's Enhance feature. It's essentially iPhoto's "I don't care how you do it, just make this look better" command. iMovie now has the same command. Select a clip in the timeline and click Enhance, and iMovie begins applying various corrections to the clip--perhaps increasing its contrast and pumping up its saturation, for example. You can undo this action by clicking Enhance again. Adjust: Click Adjust, and a series of buttons appear at the top of the Viewer. They include Color Balance', Color Correction', Crop', Stabilization', Volume', Noise Reduction and Equalizer', Video and Audio Effects', and Clip Information'. Click any one of them, and options appear below it for adjusting the setting. I think you know by now that we'll examine these options carefully in a later lesson. And that's the lay of the land in iMovie 10. As we move through the next few weeks, we'll look at importing media; the iMovie workflow; adding effects, transitions, and titles; and sharing the resulting work. There's a lot to cover, but the results will be worth it.